Rapid S integrates with all brands of high pressure die casting machines. 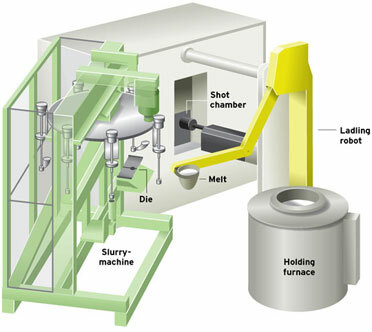 By using two programs in the ladle system, a production cell can alternate between the Rapid S process and conventional casting. The amount of solid fraction, as well as the melt weight, can be altered within a wide range of variations. Starting time is only a few minutes. Our Rapid S machines already in production goes very quickly from start mode to a steady tooling temperature .